West Virginia: Its Farms and Forests, Mines and Oil-Wells celebrates the state of West Virginia. Originally published in 1865 as a series of studies on mineral resources, observations on agriculture, and interviews with businessmen, West Virginia details the industrial statistics, terrain, and population of a state during its infancy. 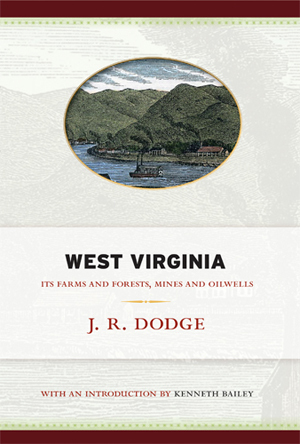 With no record of natural wealth or reported transactions of agriculture or geography prior to this overview, West Virginia sparked the curiosity of non-residents, enticing investment and settlement through descriptions of abundant natural resources and an agreeable industrial condition. With an introduction by Kenneth Bailey, this new edition of West Virginia reminds us of the state’s alluring beginning and rich, yet often exploited development. original settlement.—where virginians emigrate.—tobaccoand the blue laws.—lands.—the “tomahawk right.”—how thepioneers lived.—getting married.—progress.—population. location.—value of lands.—stock growing.—fertility.—no waste areas.— comparison with maryland, minnesota, andnew hampshire. topography and statistics of counties.—the valley group. survey of counties continued.—the mountain group. survey of counties continued.—the river district. survey of counties continued.—the kanawha valley. survey of counties continued.—the southern group. survey of counties continued.—the central group. internal improvement.—roads and turnpikes.—slackwaternavigation.—ohio and chesapeake canal.—baltimore and ohio railroad.—other railroads. petroleum.—its wide distribution.—discovery in west virginia. how originated.—popular and unpopular theories. where found.—how to find it. the era of oil wells.—the burning springs district.—the little kanawha. the hughes’ river region.—oil run of goose creek.—horseneck and cow creek. the central and northern oil region. the great kanawha oil basin.—the valleys of the guyandotte and big sandy. petroleum companies of west virginia. Jacob Richards Dodge (1823–1902) was born in New Boston, NH. He was the first statistician for the US Department of Agriculture. When he began his work he had one clerk, and when he retired in 1893, there were sixty. He became known for his ability in gathering and presenting statistics. The government sent him on two trips to Europe to observe how other countries gathered data and to share his knowledge. He was given responsibility for compiling agricultural statistics for the Tenth Census in 1880, and in 1889 he was recognized by the international community of statisticians when he received a gold medal at the Paris Exposition for his illustrations of agricultural statistics. After retiring, Dodge became an editor of the Country Gentleman and wrote numerous articles and books. He died at age eighty at Nashua, NH. Kenneth R. Bailey is professor emeritus at West Virginia University Institute of Technology, where he served as dean of the College of Business, Humanities and Sciences.